Catalyst Consulting Group is one of the premier IT consulting firms in Chicago. They manage a wide range of IT and development projects across multiple platforms. Salesforce development is a core competency for them and with over 50 employees they are one of the fastest growing and largest Salesforce consulting shops in the Midwest. Clients include: The City of Chicago, the State of Illinois, and the Chicago Department of Aviation among others. In October 2017, they were engaged by a large municipal government to do a multi-year rollout of Service and Communities on Salesforce’s Government Cloud. The end goal was for the municipality’s staff to manage support cases via Service Cloud. With over 1,800 end user licenses and 2 community licenses involved it was a significant project that required 10 full time developers and 20 business analylsts (BA’s). It was essential that the rollout went smoothly and on time. As a top tier IT consulting firm Catalyst understood the importance of implementing DevOps best practices from the start. Initially, they opted for a combination of Jenkins and Bitbucket to manage source control and deployments with Ant Scripts. However the scale of the project required them to add 20 Salesforce BAs (admins) to the project to help deliver on time. These were administrative users who had never heard of Git let alone used it. While using Bitbucket a single developer, Bryant Daniels, was the only person who could deploy changes. This created a massive bottleneck for the team. Doing a single small deployment would take a half a day on average. Catalyst wanted to find a way to engage their BAs in DevOps best practices so that they could save time deploying and allow more users to deploy their changes. Catalyst tried a number of release management solutions for Salesforce but none of them solved the core issues around usability and deployment speed. 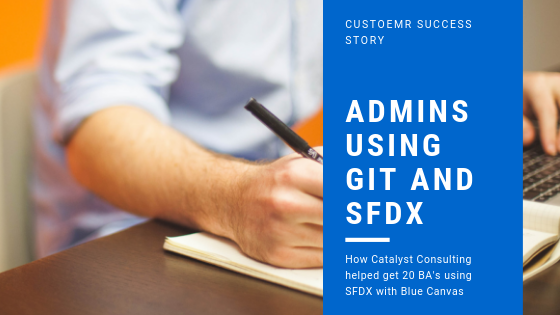 So they engaged Blue Canvas to help them run their source control and DevOps pipeline for Salesforce in a simple, highly automated flow that was easy for admins to use. With Blue Canvas, changes are automatically committed into Git on save, so that any time a BA or developer added a field or made any kind of change it was automatically committed into Git. Blue Canvas also gave BAs a simple way to compare their orgs and deploy using a simplified and streamlined version of a pull request. 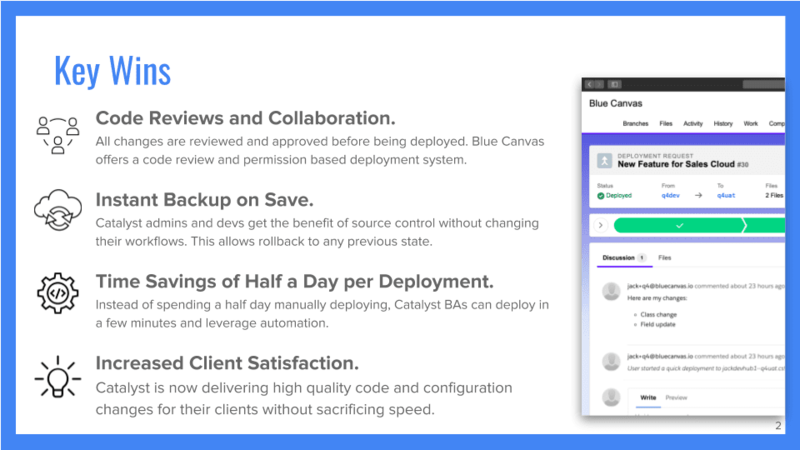 Within a day of implementing Blue Canvas, Catalyst’s BAs were deploying configuration changes in minutes rather than hours. They also had the peace of mind that all changes were backed up in Git in real time without having to train their BAs to do anything differently. Ultimately, they achieved their aim of allowing BAs to create their own deployments rather than having a single point of deployment resting in the hands of one person. Most importantly, Catalyst was able to release faster and at higher quality which led to a happy client. 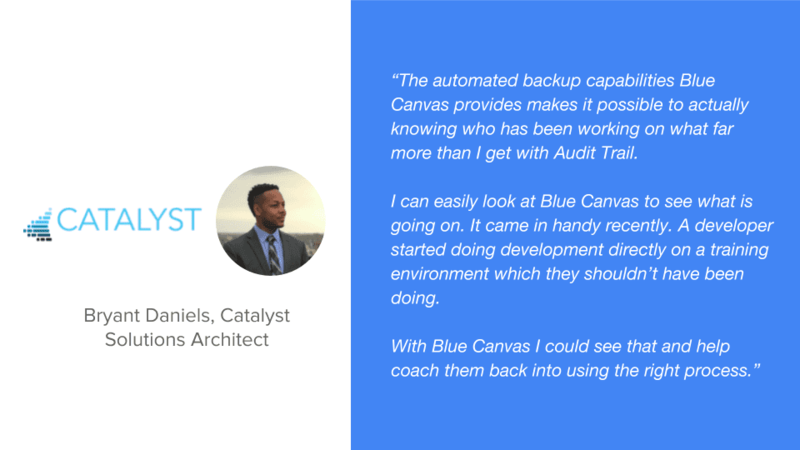 They were delivering more features on time and ahead of schedule by implementing source control and DevOps with Blue Canvas at a minimal cost.